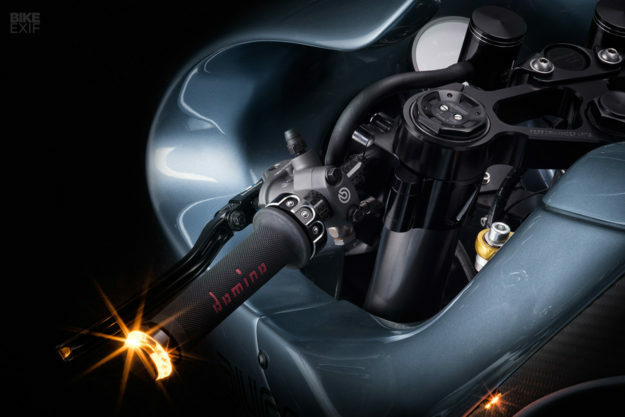 We’re suckers for fast, classic Italian machinery, and it doesn’t get much better than this: a sleek Ducati MH900e worked on by the best names in the business. 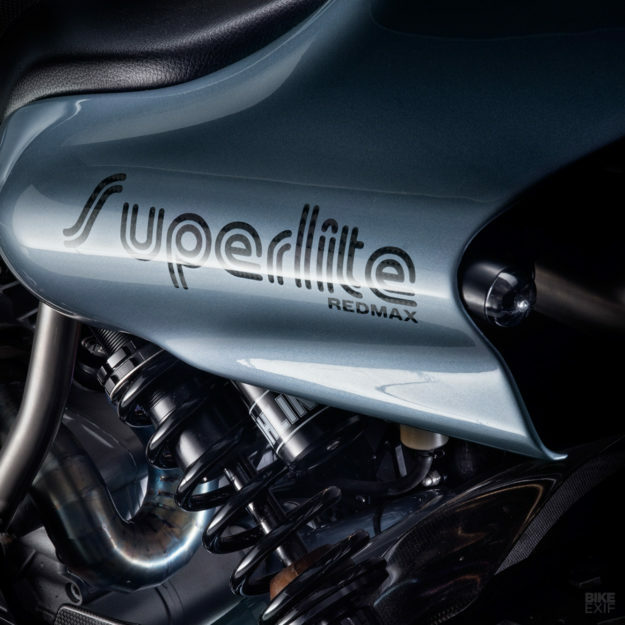 It belongs to London-based film director Gareth Roberts, who knows a thing or two about bikes. 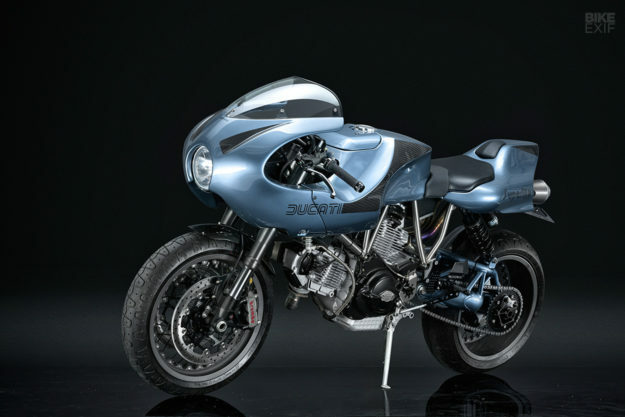 Gareth spent months combing eBay for parts, and then sourced a tidy very low mileage 900ss ie from Mint Customs, run by friend (and fellow ex-BSMC luminary) Ali Latimer. The build got serious when Gareth stumbled across Stradafab of Kansas, USA, on one of his many late night net searches. 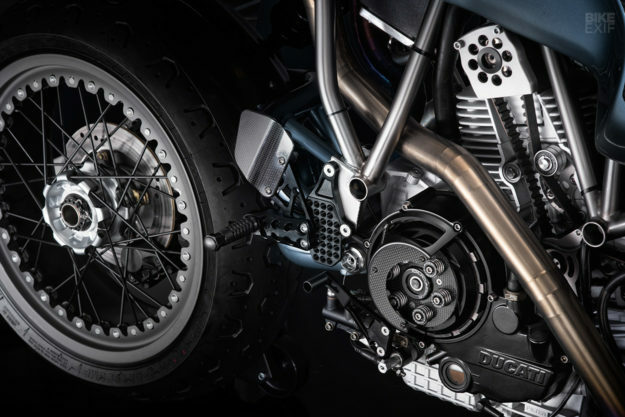 “I started talking to owner and titanium guru Randy Martin, and started scheming,” says Gareth. The original plan was to modify a secondhand titanium SportClassic frame, but then Randy decided it’d be better to build a new frame from scratch—even though it involved extensive research and the building of a new jig. The wheels are 3.5×17 front and 6×17 rear, aluminum, and running Pirelli Phantom rubber. 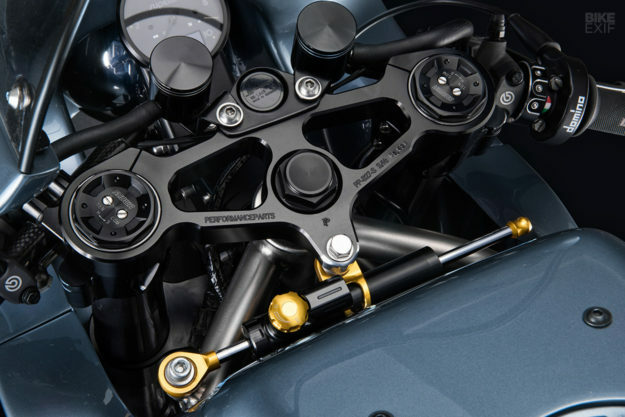 Performance Parts in Germany CNC’d a one-off set of yokes/triple trees to get the Showa big piston forks to fit, and HPS slotted in a set of their own carbon clip-ons, along with a Domino adjustable throttle mechanism. 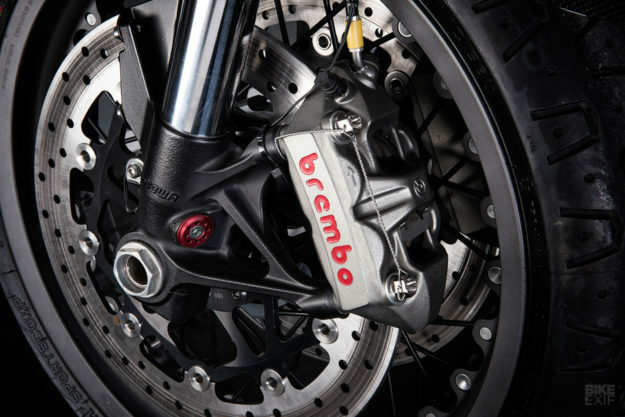 Stopping power comes from a raft of top-shelf Brembo components: A radial RCS front brake master cylinder and matching clutch master cylinder, monobloc M4 radial calipers and fully floating twin discs. Two years passed, as they do with complex builds. Gareth had now a mountain of bits in boxes in his garage, and he figured he was most of the way towards his MH900e. So he ferried everything down to Steve Hillary at the famous Red Max Speed Shop in picturesque Devon. 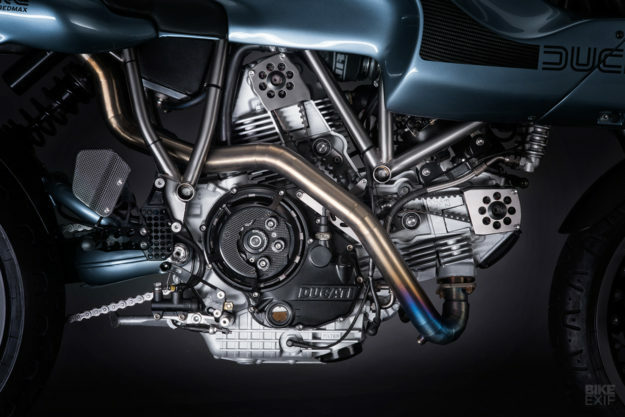 “Steve gutted the 900ss, leaving just the engine, which he stripped and rebuilt. 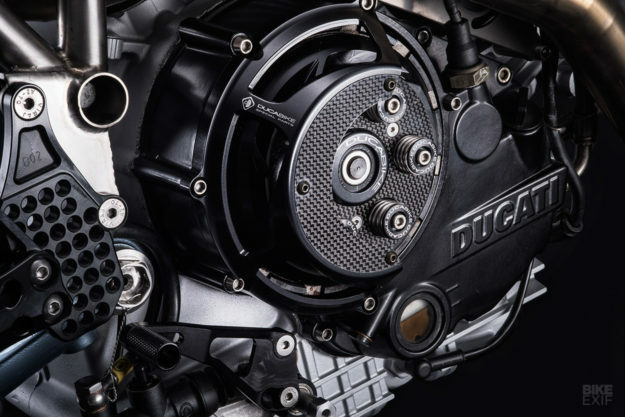 The injection system is stock, but we liberated the air box—it was blasted and then stove enameled.” Before going back into the frame, the engine was fitted with a vented clutch cover from Ducabike, who also supplied high performance clutch pressure plates and springs. 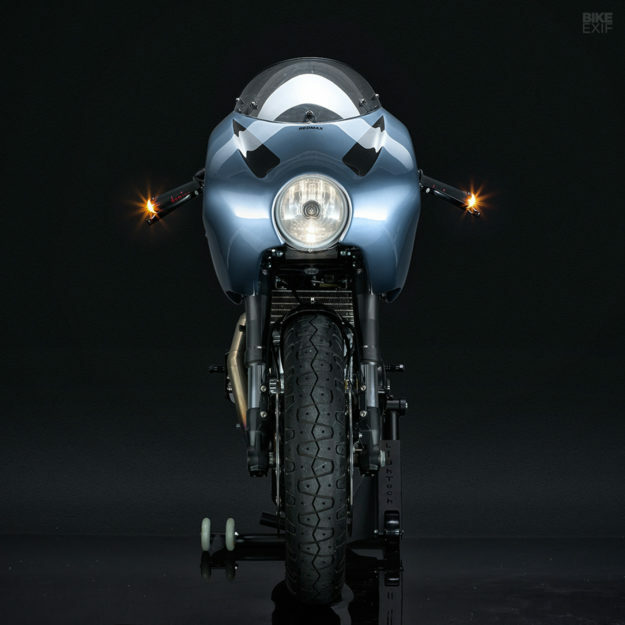 Motogadget’s finest handle the electronics: a tacho (customised by Buz Ras at Seattle Speedometer) with bespoke brackets, mini bar controls, a keyless ignition system, bar end indicators, and everything running into an m.unit control box. 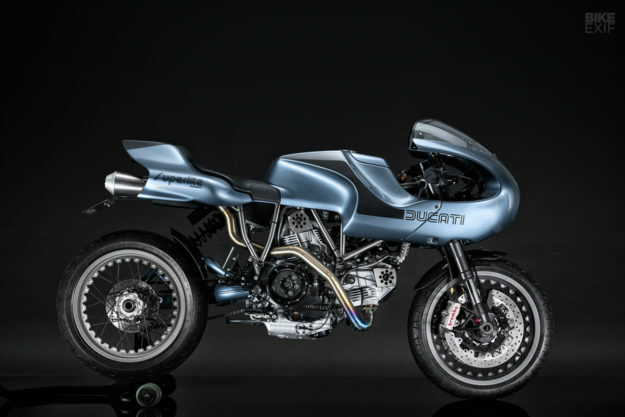 Carbon fiber replica bodywork captures the MH900e look at a fraction of the weight, coated with a delicious blue metallic applied by the Somerset firm Paint Monkey. 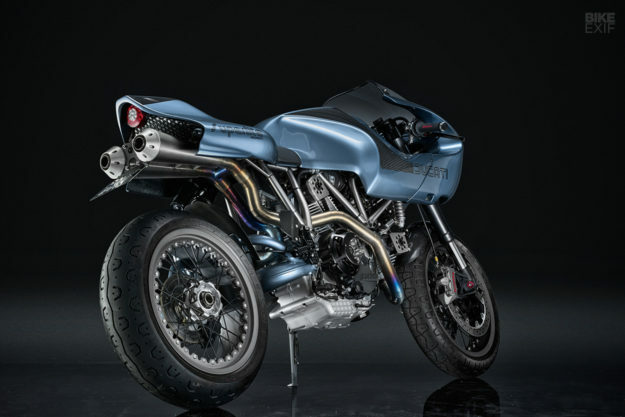 It’s not your classic Ducati red, but that just makes this incredible machine stand out even more. 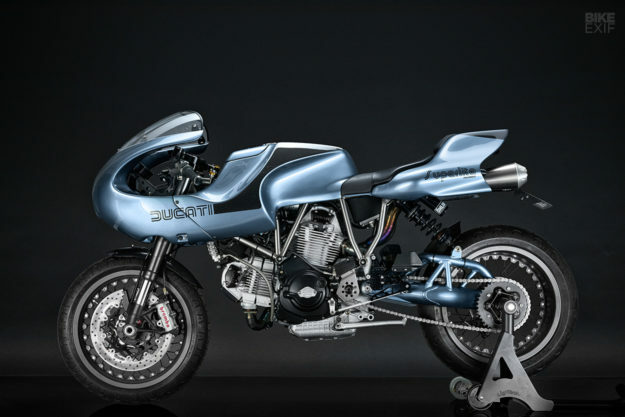 As far as 50th birthday presents go, we’d take this Ducati over heli-skiing at Gstaad, a bottle of Ardbeg 1815 single malt, or a week at Chateau Marmont. Even though it’s probably more life-threatening than all of those combined. Gareth’s upcoming film ‘Oil In The Blood’ is a feature-length documentary that explores the growing subculture of custom bike building. It focuses on the people who drive custom culture—the builders, the riders, the artists, the photographers and the curators. Here’s a peek at the trailer.